All the synopses come from the Netflix website. For more details or for other characters, please follow the links. For more details or for other designs, please follow the links. Gundam Unicorn is yet another sequel to the Gundam story — which keep being released out of chronological order. It is a story about a quest, some sort of treasure hunt, for an artifact (Laplace’s Box) that hold the fate of Humanity (or at least of the Federation) and multiple factions struggles for either revealing its secrets or keeping it hidden if not destroying it all together. 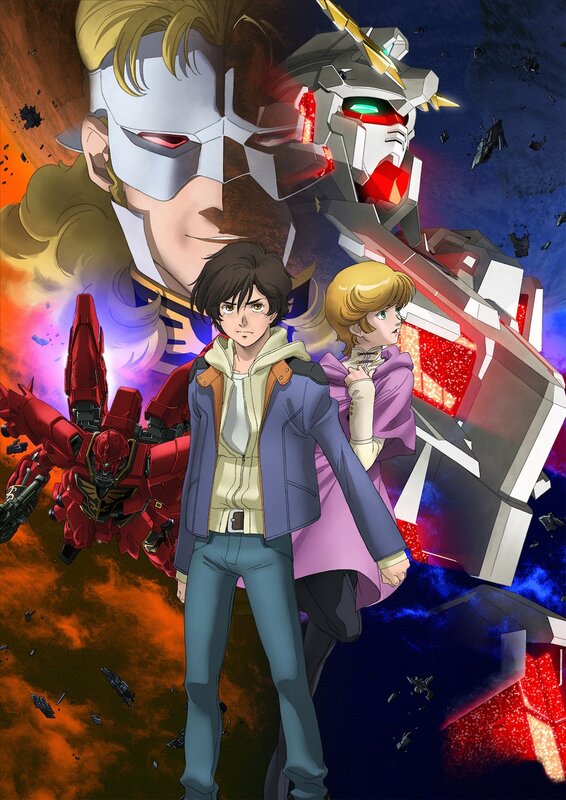 It is a coming of age story, as a young boy (Banagher Links) quickly grows up through moral struggles to learn responsibility and discover his true potential. Finally, it is a lesson on collaboration and how we can accomplish more by putting our differences aside and working together toward a common goal — possibly to usher a new era for Humanity. The story is excellent, very well written and compelling as you can’t wait to see what will happen in the next episode. Most of the designs (mecha and characters) come from the original series where they were already present (save for the Gundam Unicorn), but they were beautifully updated to the taste of the day. The animation has certainly improved a lot since the original series as it is more detailed and fluid than ever. Unfortunately, even if very well animated, the combat scenes remain a little confusing. The translation and dubbing is good and seems faithful to the original — although I will always prefer to listen to the original Japanese track with subtitles (it is so great to have the choice!). Unfortunately, the soundtrack is rather average as I barely noticed it — which is never good. The two strengths of Gundam has always been the depth of its stories and the richness of its mechanical designs. One might argue that humanoid “robots” fighting in space could seems a little out of fashion but it is a versatile concept that allows them to be as useful on land or in water and I liked that they added, in some cases, the ability to transform into fighter planes (an influence from Macross, maybe?). Gundam stories have always offered philosophical and political elements. The first can be found in the moral struggle of the characters and the idea that humanity could evolved into something more (Newtypes are people with some sort of psychic powers). The “bad guys” have always been nuanced and do horrible things only out of grief, rage or madness. The political aspect is expressed by the clash of ideologies of several factions, mirroring the same struggle between two visions of the world as it is the case in our reality, mostly between the “have” (Federation cronies and big corporations) and the “have-not” (spacenoïds). Unfortunately, the complexity of the alliances between the multiple factions and sub-factions (the Earth Federation on one side, with the Space Force (EFSF), Londo Bell, the ECOAS, the corporations (Vist Foundation, Anaheim Electronics), and the “spacenoïds” on the other with the Zeon Remnants, the Minerva faction, and the Neo Zeon) can make the story a little difficult for those who are not too familiar with the socio-political background of the series. However, despite some possible confusion, Gundam Unicorn can still be watched (and enjoyed) independently. I must also admit that the flavour of extremism alluded in the Gundam series (Nazi salute [sieg Zeon! ], Zeon as in zionism?, Prussian-like uniforms—although, in Gundam, the “bad guys” always have the best mecha & chara designs) always make me a little uncomfortable (and it could be the case for other viewers too). Finally, I must note that the inspiration behind some of the character’ names has always been a bit funny: like Char Aznable (Charles Aznavour? ), Audrey Burne (Audrey Hepburn?) or Aaron Terzieff (Haroun Tazieff?). But how can you take your opponent seriously when he is called Full Frontal !!! All in all, Mobile Suit Gundam Unicorn, like any other series, is far from being perfect but it is a fair example of Japanese animation and provides a good entertainment. I enjoyed it a lot and I hope you will too if you give it a chance. Release: The seven episodes of this OVA series were released in Japan on Blu-Ray between 2010/03/12 and 2014/06/06. It was released in North America by The Right Stuf International in four Dvd volumes (two episodes each saves for vol. 4 which contains only episode 7) between 2013/08/20 and 2014/10/07. It is also available as Dvd and Blu-Ray Box Sets since 2018/06/03. The OVA series is currently streaming on Netflix. Staff: The series was produced by Sunrise under the direction of Harutoshi Fukui, with a screenplay by Yasuyuki Muto (based on the novels by Harutoshi Fukui), character designs by Kumiko Takahashi, mechanical designs by Hajime Katoki, Junya Ishigaki, Nobuhiko Genma and Yoshinori Sayama, art direction by Shigemi Ikeda and music by Hiroyuki Sawano. Cast: Kouki Uchiyama / Steve Cannon (Banagher Links), Ayumi Fujimura / Stephanie Sheh (Audrey Burne), Daisuke Namikawa / Yuri Lowenthal (Riddhe Marcenas), Yuko Kaida / Tara Platt (Marida Cruz), and Shūichi Ikeda / Keith Silverstein (Full Frontal). Other products: The story is based on a series of ten novels by Harutoshi Fukui that were serialized in Gundam Ace and published by Kadokawa Shoten between 2007/09/26 and 2009/08/26. It was shortly after adapted into a manga by Omori Shinzo (Kadokawa Comics Ace, on going with 17 volumes so far). 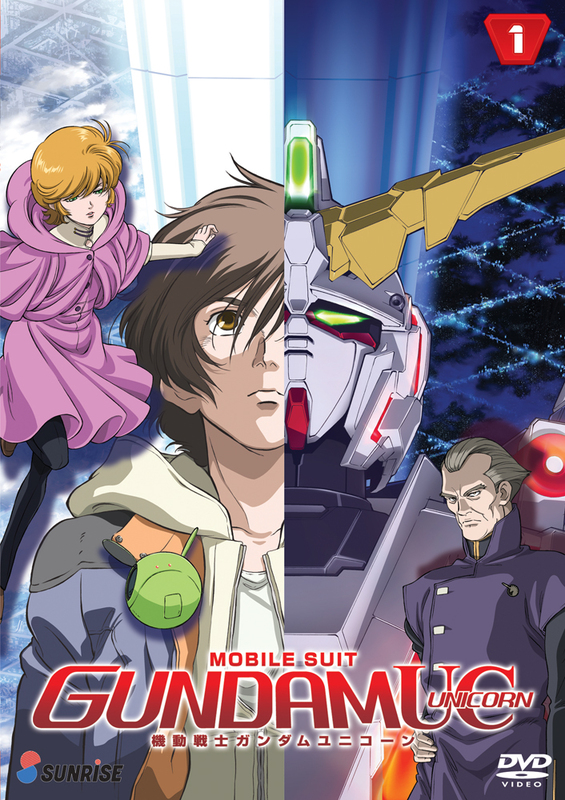 The series was also re-edited into a 22-episode TV series titled Mobile Suit Gundam Unicorn RE:0096 that aired on TV Asahi between 2016/04/03 and 2016/09/11. In the U.S., it aired on Cartoon Network (Adulte Swim/Toonami) and it is currently streaming on Crunchyroll.